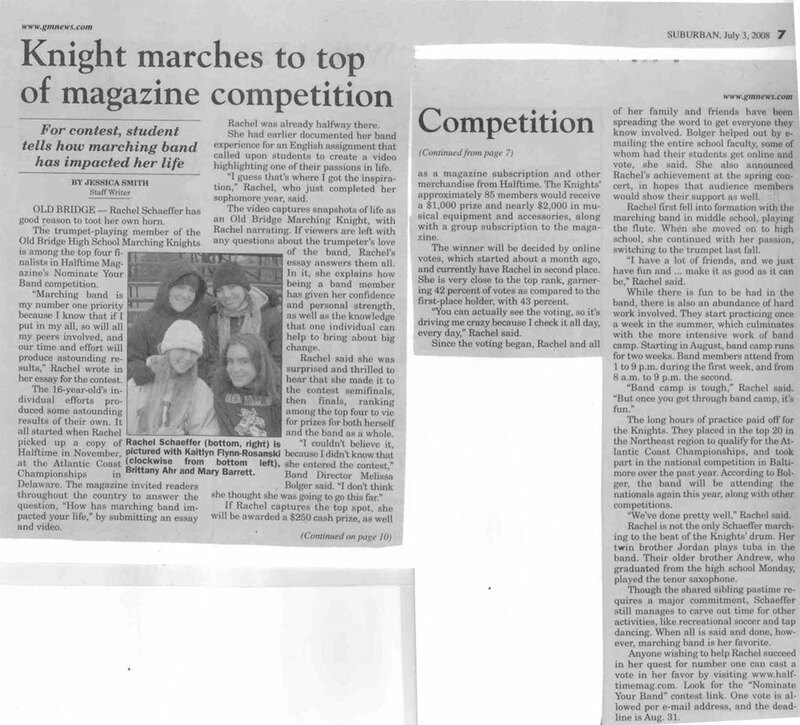 When Rachel Schaeffer, a trumpet player in the Old Bridge High School Marching Knights in Matawan, N.J., entered Halftime Magazine’s “Nominate Your Band” contest, she didn’t think much of her entry or the grand prize. That all changed when she found out she’d won. Rachel Schaeffer’s winning essay and video answered the question, “How has marching band affected your life?” An online poll of readers and website visitors determined the winner. More than $3,000 in prizes will be awarded to Schaeffer during the Old Bridge Township Board of Education meeting on Tuesday, Nov. 25th at 7 p.m., followed by a party for the entire band sponsored by Halftime Magazine®. 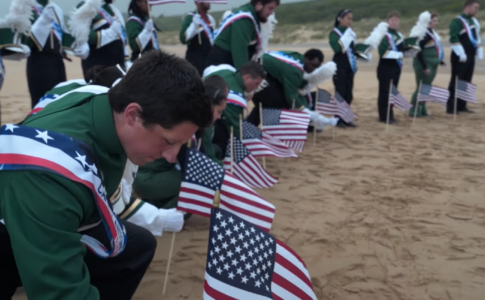 As early as February, when the marching band schedule for the ever-so-quickly approaching fall season is released, everything in my life is put on hold. Dance rehearsals become an inferior second, soccer practices are fit in where there’s time, and free weekends to hang out with my friends cease as if they never existed before. And I love it. To read Schaeffer’s essay and view her video as well as the other finalists’ entries, visit Rachel Schaefer. 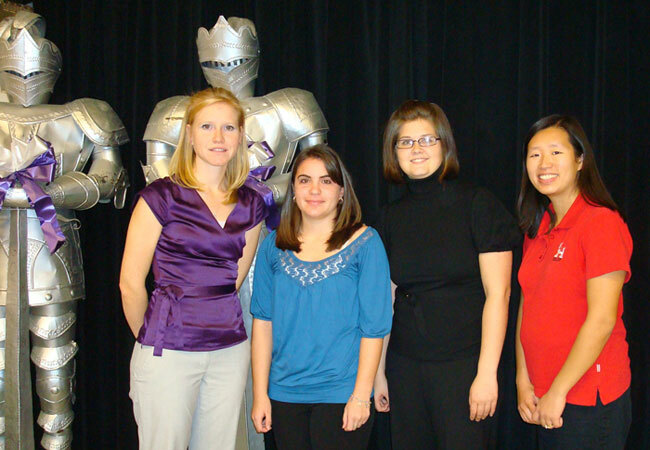 Pictured: Band director Melissa Bolger, student Rachel Schaeffer, assistant band director and Halftime Magazine® CEO/publisher Christine Ngeo Katzman gather next to the Old Bridge mascot during the 2008 Nominate Your Band award ceremony on Nov. 25, 2008. 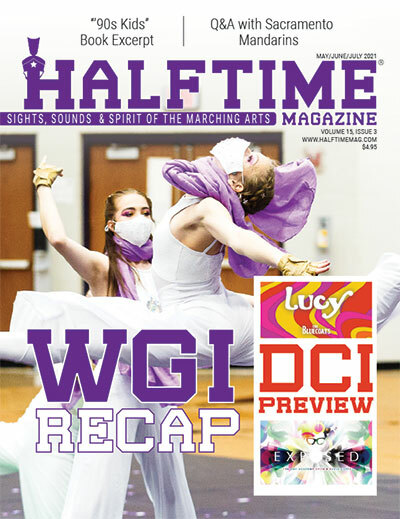 Halftime Magazine® is a glossy print publication and online community that highlights the “sights, sounds and spirit of the marching arts” and connects musician-athletes and instructors nationwide. Halftime Magazine® supports music education and is an official media partner of Drum Corps International World Championships, Bands of America Grand Nationals, WGI Sport of the Arts and the U.S. Scholastic Band Association. Halftime Magazine® is published by Muse Media, LLC in Los Angeles. 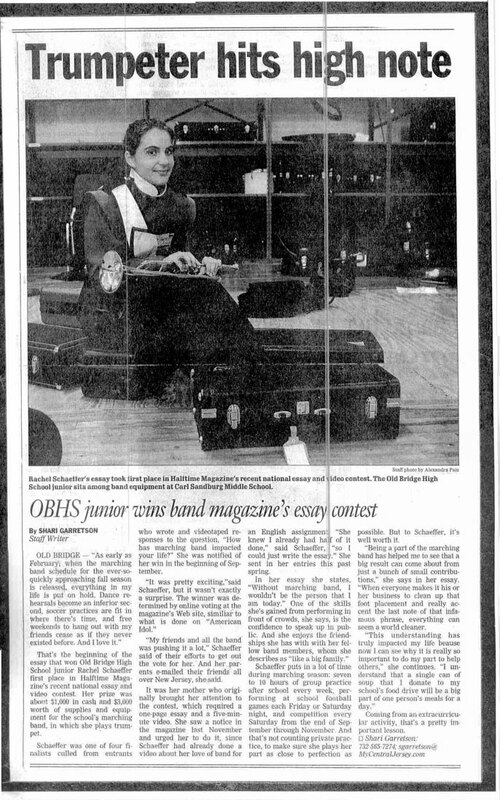 Check out the following articles about Rachel Schaeffer’s achievement in being a finalist and winning Halftime Magazine®‘s 2008 Nominate Your Band competition.